This week I wanted to continue with a post relating to community. At first, I was going to create a website for the class I teach to provide a space to enhance a sense of “community” among the students. I started it but it is still a work in progress. I was inspired after seeing what others were doing to follow up on an idea I had had some time ago. I share many of my sketches and detail sections of some of my paintings that I use in animations on one of my Instagram accounts. I developed a strong sense of community with some of those I follow and those who follow me. We share tips, advice, and support. One asked me about my technique and if I had ever done a time-lapse of the process. At the time I had not, but I thought this might be the perfect opportunity to make one since in a way I feel like it is adding to the “community” I have built. I used both the iPad Air and my iPad mini, one to look at reference images and the other to record(really need a tripod or something for this otherwise just stacked things up and put the mini on top). The process was fairly easy and enjoyable, though there was some issues that came up when moving the file between apps. It was also to large to upload and required using my laptop. I recorded in the Hyperlapse app and easily transferred my video from one iPad to the other using Airdrop. I edited with iMovie app, though I wish it had more ways to edit contrast and light. Here it is part of it uploaded to YouTube, ( the initial drawing, masking, and painting) a watercolor time lapse based on an MRA image of the brain. 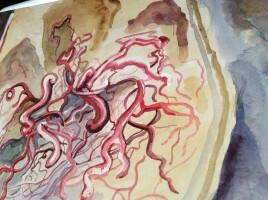 Thanks for posting – it’s fascinating to see the process of a painting come into existence – I really like the brain blood vessels… and to see how the piece looks wet, compared to the dry, still detail… really nice! What a great weekly create! I love seeing both the finished piece *and* the process behind how it was made! I’d love to know more about the challenges of sharing the video between devices. It seems like this is a common challenge — integrating between apps and services. I need to understand where this process is falling down. Thank you!